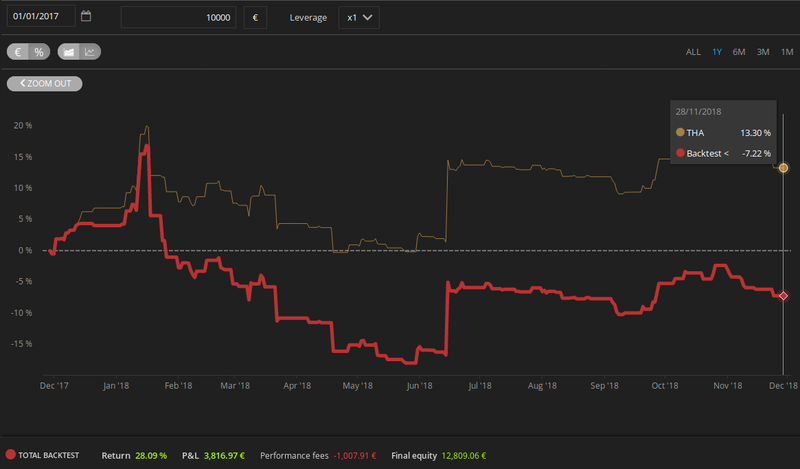 The DARWIN backtesting tool calculates and visualizes the return, P&L, performance fees accrued, and the final equity of any DARWIN investment porfolio you create. The DARWIN backtesting tool is useful when searching for investment strategies because it enables investors to know the aggregated past evolution of a portfolio of DARWINs. The backtest’s curve enables investors to evaluate the correlation, the risk taken, the profitability, drawdown and form of return generation. Another use of the backtest consists of comparing the performance of a real investment portfolio with that of the same portfolio in the past. The more future curves resemble past ones, the more robust the portfolio. Past curves can also orient us as to where to define stop losses and take profits on the portfolio level. Get started by first setting the starting date of the simulation. Set the capital invested in the portfolio. Then select the DARWINs you’d like to add to the portfolio. You can add DARWINs by using the search feature or by selecting them from a list. The lists available are those of all DARWINs, the default filters, your custom filters or that of the DARWINs you currently have in your real portfolio. Once you’ve added the DARWINs, you’ll see that their weight in the portfolio gets distributed evenly. You’ll also notice that after adding the DARWINs, the backtest gets instantly calculated and visualized. The backtest’s result is divided into a section with the totals and a section with charts. In the row of totals you can check out the return, the P&L – in your Wallet currency -, the performance fees paid to the traders and your final equity which is the sum of your invested capital, your P&L and the paid performance fees. The chart section offers various types of visuals. By default, the chart will show return percentages in a line graph. The red line represents the evolutions of the backtest’s total while the other lines show evolution of return of the individual DARWINs that compose the portfolio. By placing the mouse cursor over the chart, you’ll see additional data: exact returns of the backtest and individual DARWINs with the highest returns. You can also zoom into the chart at any point you wish to. If your choose to visualize the backtest in an area chart, you’ll keep seeing the red line with the backtest’s total return surrounded by a grey area representing the oscillation of the return of individual DARWINs in the portfolio. Finally, you can choose to see evolution of P&L and performance fees. You’ll be able to see evolution of the P&L of the portfolio, of trades and that of performance fees paid to traders. P&L of the portfolio is the result of P&L of trades minus performance fees paid to traders. It is thus normal that backtest results don’t correspond exactly with the constituent DARWINs’ returns. It’s because of this characteristic that it’s useful to run a backtest even with a sole DARWIN. While the DARWIN’s curve – on the DARWN’s page – shows notional return (without divergence, without performance fees), the backtest will show actual return including investor divergence and net of performance fees. The tool has a sharing feature providing you with a URL that’ll show the backtest to people loading the URL in the same way as you see it. If you prefer, you’re welcome to share the backtest directly on Twitter, LinkedIn or Facebook. What do you think about the DARWIN backtesting tool? As always, we’re eager to hear your feedback and comments. Just found out that backtesting ignores imported history - I am guessing intentional design decision, since divergence and whatnot can't be discerned. The backtester only measures performance since the DARWIN was created, thus imported history is not calculated. Yes, the THA backtest for 1 year looks weirred. Maybe I'm missing something. In the chart is say +14% and backtest -7% . The second image is from THA directly and states "only" 10% divergence instead of 21% as implied in the backtest. that would make it even worse because divergence wasn't that bad 6 month ago. So the actual, average yearly divergence should be roughly around 6% . The backtest implies IMO that it's much more. Edit: I just noticed that changing the chart time setting doesn't affect the results at the bottom. The calendar at the top left corner has to be changed as well. yes, performance fee is not considered in divergence in the Darvin, but my gut feeling is that this isn't really the reason for the big difference because there was rather little performance fee paid in this case. Also this post explains the Darwin divergence, thus the difference to backtest divergence , as explained in this article. As you said @yhlasx , Darwin divergence doesn't seem to be 100% the actual investor divergence. Monthly Divergence can't take into account every kind of investor Divergence, as there are some causes that affect all investors and some others individually-driven. THA has suffered a long period of high Divergence that has affected investors (as you see), but even though investors have managed to have profits on a longer period than 1Y. Performance Fees are taken into account on the Backtest. I hope this makes everything a bit clearer. As much as I like this new tool, there is a serious issue in my opinion. In its current form, the backtester causes a pretty strong survivorship-bias. Let's say I create a filter that is based on d-score. This filter will automatically give me Darwins that have performed good in the recent past as d-score is closely correlated to performance. Therefore such a portfolio will always perform pretty good in the last months. To overcome this issue the backtester needs to apply the filter at the start of the simulation. Ideally, you also should implement some kind of exit filter that sells certain Darwins during the simulation. That way it would be possible to do some sort of portfolio rebalancing (daily, weekly, monthly, etc.) according to entry and exit filters. It is not an issue of the tool but of the selection that you test on the tool. If you have a selection of darwins that were visible one year ago the test is significant. As a newbie investor here I am very appreciative of all the efforts from some of the very talented Community members here that will greatly help in our portfolio selections. Thanks for the feedback, @asder34! 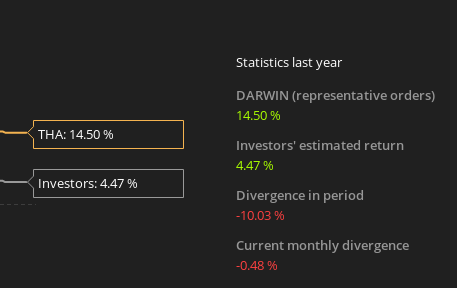 There is an API for DARWIN investors willing to download past DARWIN data (https://community.darwinex.com/t/darwin-api-beta-testers-wanted/4566), please let us know should you be interested in trying it out! There is just a little problem... to use the API you have to be a programmer. Time to learn some Python coding skills, it is! Its been decades since I have touched/worked in programming unfortunately. I imagine it would be time consuming to get into it again. I hope you can implement it on this tool (or a new one) cause its really very helpful in analysing darwins.